Product #2957 | SKU AJ-P33MP | 0.0 (no ratings yet) Thanks for your rating! The AJ-P33MP DVCPRO digital cassette tape brings an exceptional compact size and high reliability to broadcasting applications. This 6.35 mm wide metal particle digital tape for broadcasting - the world's smallest and lightest - incorporates newly developed high-output metal magnetic particles that have made downsizing possible while delivering superb picture and sound quality. 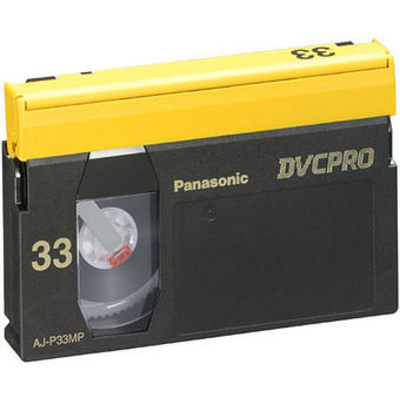 The DVCPRO tape also boasts excellent tape transport stability and outstanding durability.